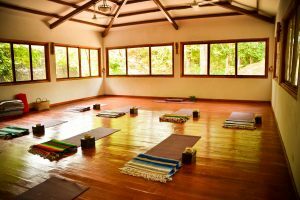 Our retreat center features a beautiful 860 square foot yoga studio. The studio is surrounded by nature, has a jungle stream running around it, features beautiful tropical hardwood floors, and is filled with love. Our studio is fully equipped with yoga mats, yoga blankets, straps, blocks, yoga chairs, and bolsters. We have a fleet of SUP boards to accommodate your Stand-up-paddle boarding needs. 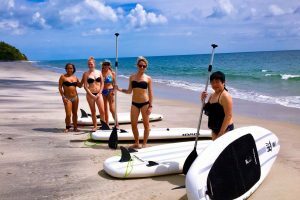 Our boards are perfect for beginners and experienced paddlers and are “all around boards” made to tour the open ocean, practice on flat water lagoons, explore mangroves, tour lakes and practice SUP yoga. Our family dining area with an adjoining bar overlooks the property. 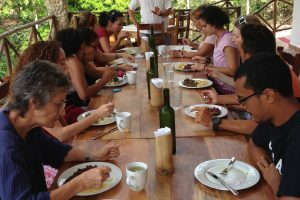 You feel like you are eating your meals on the tree tops – surrounded by nature. Our air-conditioned Common Room is perfect to escape the heat of the day. It features a large and comfortable room with sofas, books, board games, and a ping-pong table. Great place to relax and bond with your fellow travels or members of your retreat group. The Common Room can also be set up for small group meetings and presentations, depending on the needs of the group. 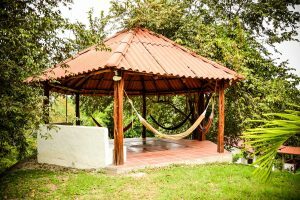 Our property is dotted with areas, including our main rancho, that are perfect to relax or meditate in silence. These areas are always open to our guests. The main rancho has wi-fi access. Our property has a short hiking trail through the forest and around the spring fed pond that is home to a family of dwarf caimans (no swimming please :-)). The trail winds through 7 different stations with inspirational quotes about tolerance and compassion. Ideals that the owners embrace. Perfect for birdwatching. Keep your eyes out of the tamarind monkeys and other wildlife that live in the area! 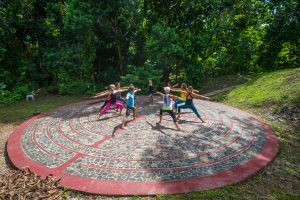 Labyrinth walking is an ancient practice used by many different faiths for contemplation, prayer, and spiritual centering. Entering the serpentine path of a labyrinth, the walker walks slowly while quieting their mind and focusing on a spiritual question or prayer. We are a 5-minute walk to a secluded beautiful beach. 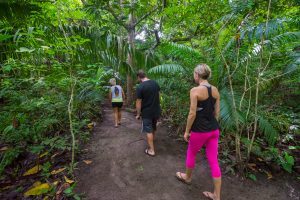 As you approach the beach, the last 2 minutes of the walk are through a jungle trail with the warm tropical Pacific Ocean waiting for you. 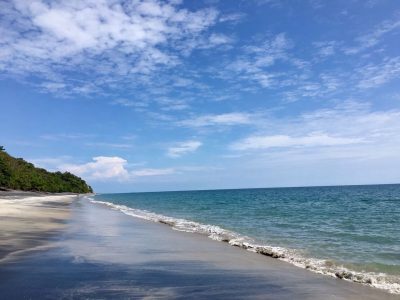 Something that attracted the owners to the area is the miles of black and white sand beach that has plenty of natural shade from the rainforest that grows close to the water’s edge. The beach is a great swimming beach and almost always calm except on the rare occasion when storms can produce a powerful shorebreak. If you wake up early you can see the sunrise over the ocean and the local fisherman and lobster fisherman bringing in the catch of the day. You may run into the Istmo staff buying your dinner. The beach is also a nesting ground for marine turtles that come to these shores once a year to lay their eggs.